MAJOR EQUIPMENT are bringing their durable Cyclone mowers to Cumbria on 30th April at 4pm. Visitors will have a chance to see both 4.2m winged and 2.8m rigid deck versions of the Cyclone mowers in action at Murray House Farm, Cumwhinton, Carlisle, CA4 8DH later this month. MAJOR product specialists and Carrs Billington representatives will be on site to help and advise on the most suitable mower for your application. This is an excellent opportunity to learn more about the superior shredding capabilities of the award-winning Cyclone rotary mower. 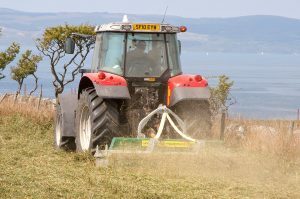 Designed to clear gorse, brushes and saplings as well as every day pasture topping, the Cyclone mowers have a patented, double-chop blade system capable of efficiently clearing crop stubble such as maize, rapeseed and other vegetation. The gearbox driveline has less wearing parts than a flail, reducing overall maintenance costs. The mower is built using Strenx™700 MC high-performance steel and has a galvanised body to ISO standards for durability and long lifespan. 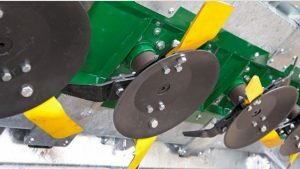 The Cyclone mower also uses 25% less power and fuel than a conventional flail or batwing mower due to their unique blade design. These rotary mowers are designed for the most rugged working environments with reduced power consumption, outperforming equivalent-sized flail mowers in every way.